PREMIUM SELECTION by e-domizil is a important partner for renting our ALPINE LODGES. We appreciate the high awareness level and the close collaboration. PREMIUM SELECTION flawlessly takes over all touristic services for our holiday properties in historical monuments. Our "special interest" offers always finds the suitable customers through the flexible and always target-oriented collaboration with PREMIUM SELECTION by e-domizil. What differentiates PREMIUM SELECTION from other online travel agencies? PREMIUM SELECTION is specialised for extraordinary holiday homes worldwide and provides customers and landlords an adequate platform. Furthermore we provide an experienced service team in Zurich able to assist customers and landlords in four languages. PREMIUM SELECTION assume the management of the booking up to the payment, what reduced your default risk. PREMIUM SELECTION apply the offer to customers how are explicitly interested into extraordinary holiday homes. Its basic is built on the partnership with the newspaper Neue Zürich Zeitung NZZ. 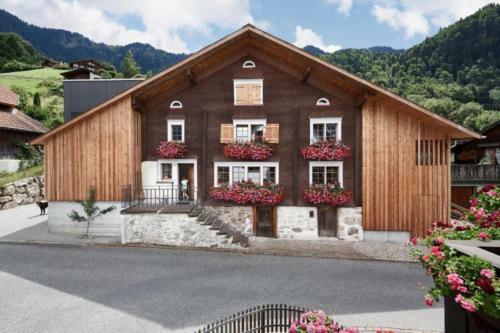 Outside of Switzerland we rely on our renowned distribution partners as for examples: Bellevue Ferienhaus, Luxury Rentals (HomeAway), Kuoni, Casamundo, Thomas Cook, Schweiz Tourismus and many more. You administer and look after your holiday home in the landlord area of PREMIUM SELECTION without fix allotment. You hire only what is truly available. Your regular clients can be handled with you directly. The calendar can be maintain either in the landlord area or via iCAL. As soon as a customer books we send you an e-mail where you confirm the booking with only one click. With this double-bookings are excluded. The costumer receives all necessary information for his journey from our side. Approximately 7 day before arrival we transmit the net journey price to your account. You do not have any cashing risk. Customers are able to rank their stay after the return. Which criteria are required of your holiday home? To be able to publish a holiday home on PREMIUM SELECTION, it needs to be special somehow. This can be a luxury fitting, exclusively situated or an extraordinary type of holiday home. Additionally professional pictures are available and furthermore the descriptions, prices and availabilities need to be complete. The decision to accept the admission will be done manually by our experienced team. If our criteria are not fulfilled, the holiday home will be published on www.e-domizil.ch and the affiliated distribution channels. How much costs PREMIUM SELECTION? The advertisement is free of charge. We work with a provision model based on success. For successfully carried out journeys with the disbursement 17.5% provision excl. VAT will be charged. Further individual possibilities to promote your holiday home through the Neue Zürcher Zeitung NZZ will be communicated with the newsletter. How can I publish my property on PREMIUM SELECTION? Register direct on top of this site as landlord. If you have several holiday homes and/or a software to administrate them, please contact us directly via contact form. Here you also find our e-mail and phone number. How is my freedom concerning availabilities and pricing? The decision for availabilities and prices are completely in your control. You only set available what is truly allocatable and bookable. Your regular guests can still be handled with you directly. In return you provide the same prices and conditions on PREMIUM SELECTION as on other platforms. Where do I find information about the duration and other contract-based questions? You’ll find detailed information about this in the general terms and conditions. My question still remains without answer - what can I do? Contact us via contact form. Here you also find our e-mail and phone number. * The network of PREMIUM SELECTION by e-domizil includes renowned distribution partners worldwide as for examples: Bellevue Ferienhaus, Luxury Rentals (HomeAway), Casamundo, Thomas Cook, Switzerland Tourism and many more.